purpleandlime is a fun, luxurious womenswear line inspired by Rebecca George's fashionable vision. Opulent jeweled pieces merge with exotic influences to create dramatic yet wearable clothing and accessories. 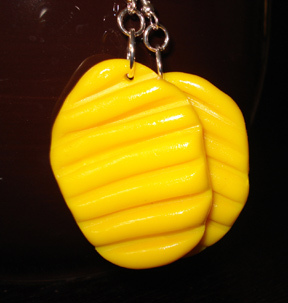 Rebecca enjoys making jewelry from a variety of materials, especially polymer clay because of the malleability and wide range of colors available. 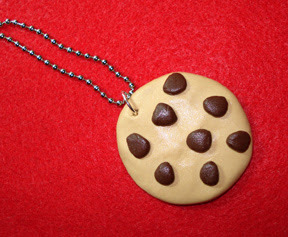 Her current obsessions include making food-inspired jewelry: chocolate-chip cookies, potato chips, and breakfast foods! Rebecca is originally from Cincinnati, Ohio. She graduated from the University of Michigan in Art History and Geology and then earned a degree in Fashion Design and Marketing from the American Intercontinental University in London, England. Several pieces from Rebecca’s senior collection entitled “The Power of Queens” were in i-D Magazine (UK, Feb. 2007), and she also worked on men’s leather pouches for the movie Elizabeth: The Golden Age, which won an Oscar for Best Costume. Those are just about the cutest things I've seen in a long time! 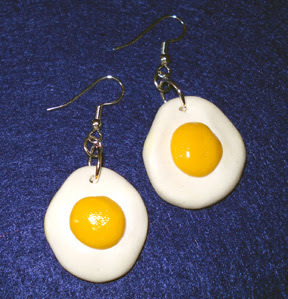 Love the cookie pendant and egg earrings.